A Page Dedicated to All Those who Resisted the Collective Insanity and State Sponsored Mass Murder known as the First World War. HUDDERSFIELD and its’ surrounding villages was one of the main areas of opposition to the War. Fortunately it is also one of the best researched and documented areas thanks to the work of local historian Cyril Pearce. Details of local men who resisted the war can be found on his national database of nearly 17,000 WW1 Conscientious Objectors, which has now been put online by the Imperialist War Museum. This short film, including an interview with Cyril, depicts the Tribunal hearing of one of Huddersfield’s leading Concientious Objectors, Arthur Gardiner. A member of the British Socialist Party, he opposed the war on unequivocal working class solidarity grounds. 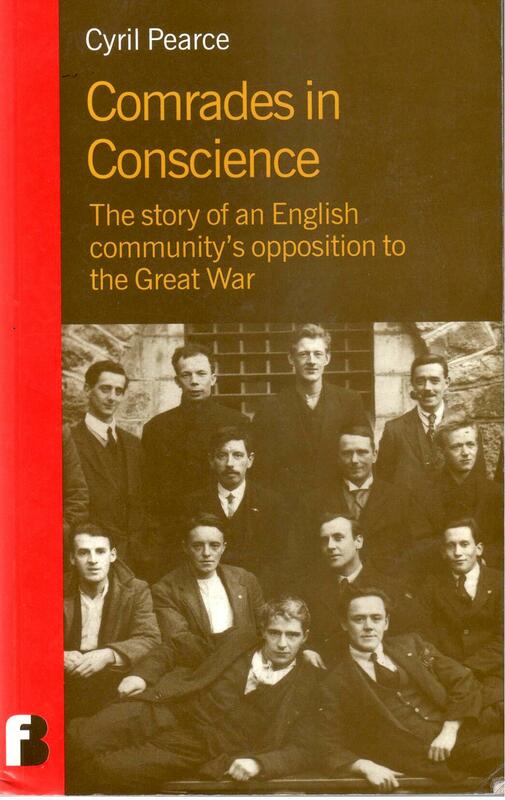 Brother Pearce’s book Comrades in Conscience – The Story of an English Community’s Opposition to the Great War’, which appeared in 2001, is the best account of Conscientious Objectors and their local background anywhere. It examines both the social and political milieu which fostered a strong anti-war sentiment and describes the beliefs and individual experiences of the COs themselves. A review of the book, and other material on the opposition to the war, will follow over the coming months in the build up to the World War Centenary Commemoration in 2014. The cover photo shows Huddersfield Socialist Sunday School conscientious objectors in Dartmoor gaol, 1917. In recent years, mainly due to the study of working class and radical history, the thesis that the First World War was universally popular, except amongst a few cranks, has been increasingly challenged. Cyril Pearce’s book, ‘Comrades in Conscience – The Story of an English community’s opposition to the Great War’ is an important contribution to this debate. Comrade Pearce sets out to examine (pro-war Labour MP) Will Thorne’s description of Huddersfield, as a ‘hotbed of pacifism’. Was the town indeed such a ‘citadel for the anti-war cause’? This book is an in depth local study in which the author affirms that the view from Huddersfield is as valid as that from Colindale, (the British Library newspaper collection), or the Imperial War Museum. This book is not only important because of the light it throws on its subject, but also as an example of how good local history, which sets local events firmly in the context of national, and even international, history, should be researched and written. Its’ main theme aside, it is an excellent portrait of a northern industrial town in wartime. The strength of anti-war sentiment is attributed to the widespread influence of the labour and socialist movement in the Huddersfield area, combined with a deep rooted radical liberal tradition of Cobdenite democracy and anti-imperialism. These were intertwined both with non-conformist Christian beliefs and a vibrant secularist culture which together created a strong ethical underpinning to political ideas. Comrade Pearce’s chapter on Huddersfield before 1914 explores these influences and vividly sets the stage for the outbreak of war. This chapter stands as perhaps the best published summary of Huddersfield in this period and worth a read on this account alone. Particular emphasis is placed on the ethical element in socialism expressed in the Socialist Sunday School movement and the Independent Labour Party but which is also evident amongst the Marxists of the British Socialist Policy. This lent a particular moral force and vitality to many individuals in their personal resolve to oppose militarism in all its forms. All books have their errors and omissions and this reviewer turns to such in Comrade Pearce’s book only because their correction reinforces the author’s own emphasis on the importance of anti-militarism. On page 62 there is a reference to a ‘battle between nationalist gun-runners and the army’, as a result of which four were killed and many wounded. In fact this incident, the ‘Batchelor’s Walk massacre’, took place after the gun-running operation at Howth when humiliated British soldiers returning to Dublin shot into an unarmed crowd of civilians. This event, the Curragh mutiny, the arming of the Ulster Volunteer Force – coming on top of the state’s repression of the Dublin lock-out ,(which led to the creation of a workers’ defence force, the Citizens’ Army), all fuelled the understanding that the British state was the foremost enemy of British and Irish workers. 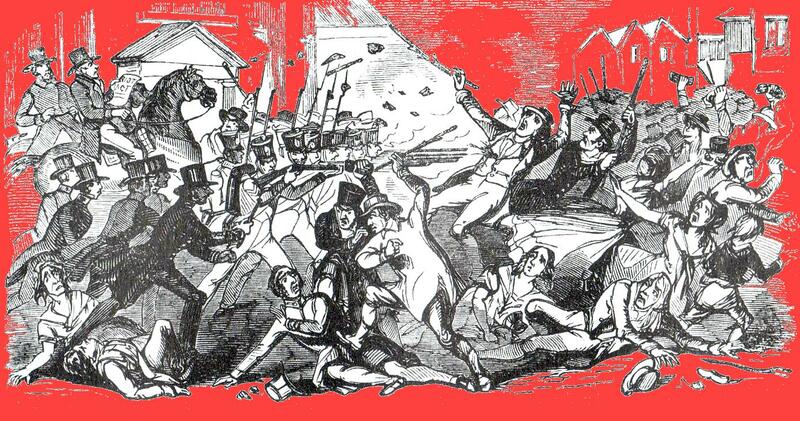 The upsurge of syndicalist agitation, strikes and riots since 1910 also clearly exposed the nature of the British state as an instrument of repression. The arrest of Tom Mann, (a speaker popular in the area), for his ‘Don’t Shoot’ appeal to soldiers aroused much local concern while in early 1914 the arrest and deportation of South African strike leaders also produced protests . Jim Larkin himself spoke in Huddersfield in March . In fact, in the months preceding the war much attention was given to home-grown militarism. Although the main strand of opposition to the war stemmed from the belief that war was morally wrong, there was also those who had saw that state violence was a class issue and that militarism was a weapon used by capitalists against the workers – whatever their nationality – and a significant minority of those who opposed the war drew their strength from this conviction. They saw the struggle against the war as a continuation of the class struggle, or ‘industrial war’ as it was sometimes referred to. Comrade Pearce’s account refers to this, particularly with regard to the BSP, but perhaps not enough emphasis has been given to either the syndicalist, or internationalist, influences on local socialism. On the eve of hostilities opposition was shown by a massive ILP demonstration In Huddersfield’s St George’s Square condemning entry into the war and, later on the same day, in the same place, a Trades Council demonstration in support of the striking engineers labourers also challenged the slide to war. Jess Townend of the BSP called for a general strike which was seconded by Alderman Wheatley, one of the socialists who did a sudden volte face when fighting began. The left was already riven by sectarian disputes before the war, particularly between the ILP and BSP. But the war cut through existing party loyalties. The BSP was shocked to find that J B Hudson, a speaker invited from Manchester BSP to address a meeting in St George’s Square on 22 August, declared his support for the war. Even the anarchists were divided. The baker, George Henry Greensmith followed his inspiration, Kropotkin, and became a staunch supporter of recruitment, while another anarchist H B Flanders, (whose son burnt his call up papers) , remained opposed to the war and suffered a police raid on his house. Erstwhile comrades found themselves deeply divided – the ‘patriotic socialists’ forming the Huddersfield Workers Own Recruiting Committee and the anti war socialists joining the No Conscription Fellowship and No Conscription Council. The arguments on both sides as recorded by ‘The Worker’, Huddersfield’s socialist and labour newspaper, are vividly set out in the book. Despite the passions which were aroused , Huddersfield experienced on the one hand a high level of tolerance towards anti-war opinions, and, on the other, little display of ecstatic jingoistic hysteria evident in other places. Only one serious incident of violent disruption of a pacifist meeting is recorded and even then the ‘pacifists’ managed to fight off the servicemen. The idea that many flocked to the colours only out of patriotism is also debunked. Economic pressure due to unemployment levels as well as inducements and coercion by employers was also a factor. The practice of ‘releasing labour’ – in reality sacking single men – was increasingly used to boost declining recruitment numbers. With the left in such disarray no collective resistance to the war in the form of strikes was possible. Although they may have had the backing of the NCF and NCC, their political parties or faith groups, ultimately the burden of resistance fell on individuals who took a personal decision to make a stand against taking up arms. Nevertheless, as Comrade Pearce points out, they reflected, and spoke for, a wider group consciousness. Opposition to potential conscription had existed even before the war. The actual imposition of conscription in 1916 with the Military Service Act revitalised the campaign and also demolished the role of labour and trade union bodies as recruiting agents, throwing many former pacifist socialists into a further dilemma, – voluntary recruitment was one thing but coercion another. It also split the ranks of the Liberals. The Huddersfield MP Arthur Sherwell, voting against the measure, clashed with the local Liberal Association and announced he would stand down at the next election. The operation of the Tribunals set up under the MSA and the mechanisms for processing Conscientious Objectors is carefully explained by Comrade Pearce , as are the differing motivations and levels of resistance among the COs themselves. The clash of views which emerged at the tribunals are revealing not only of differences about the war but also social and political attitudes which are rarely expressed elsewhere. Much interesting material is contained in the book’s copious appendices, which reproduce newspaper reports and biographical details of the COs and other actors in the pro- and anti-war camps. The dialogues at the Tribunals are particularly interesting. (One of these, the case of Arthur Gardiner, has been made into a play script and extracts of the hearing are also dramatised on a video clip which can be found elsewhere on this page). Comrade Pearce never claims that the anti-war resisters in Huddersfield were in a majority. Exactly how influential they were is hard to quantify, or how far tolerance of their views translated into actual sympathy. However, the book successfully argues the case that resistance to the war in Huddersfield, (and its hinterland, which is not fully explored), was different. Just how different, Comrade Pearce leaves open to question. Hopefully his subsequent research on a comprehensive national data base of COs has thrown up some answers. The fruits of that research, his forthcoming book ‘Communities of Resistance – patterns of dissent in Britain during the First World War’ (Francis Boutle 2014), will reveal more stories about COs and the communities which nurtured and sustained them. Today we should be asking again – why is there not more opposition to militarism and war, instead of the creeping glorification of the hero cult of the armed forces we have witnessed over the past decade – a glorification which the Centenary of the Great War is already being manipulated to advance. 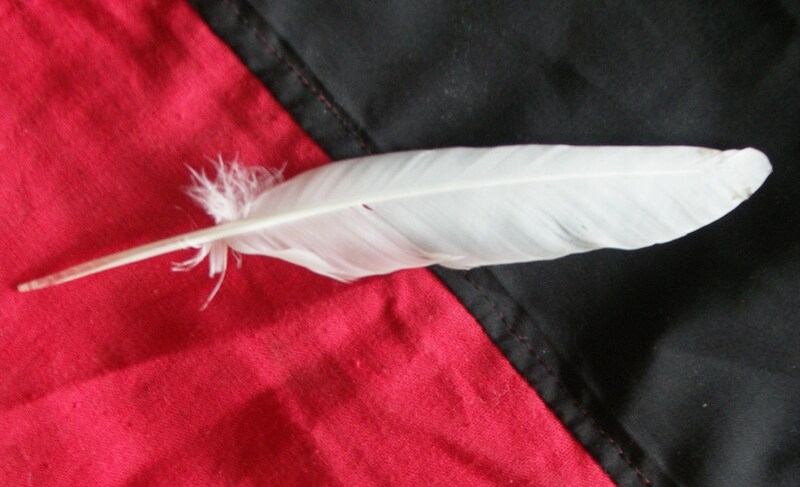 And why, despite economic crisis, growing injustice and inequality are there not more ‘Communities of Resistance’ ? These are crucial questions which radical history may go some way to providing an answer. (Since this was written a new edition of Cyril’s book has been published. See: https://undergroundhistories.wordpress.com/2014/02/25/comrades-in-conscience-by-cyril-pearce/ ). Cyril Pearce’s CO data base will become available later this year on the Imperial War Museum’s ‘Lives of the First World war’ site. [see the link]. Great Grandad Mark Brooke – My Family War Hero. Among the Brooke family photos we have a picture of great granddad Mark dating from the First World War, apparently in some sort of Highland military uniform. This is strange, because gt granddad was neither a Scot nor a soldier. In fact he was a Conscientious Objector. Why, and what did he do in the war, only solicited brief replies from my father. He was against the war because it was ‘a capitalist war.’ And because he refused to fight he had to work in a quarry in Scotland. That partly explained the uniform, but I was always intrigued why, if he was against the war he would put on this get-up for a photo recording his involuntary stay in Scotland as a CO ? Mark, then aged almost 18, appears with his brother Hamlet in the membership list of Honley Labour (later Socialist) Club in 1895. Their brother Havelock also later appears as a member, although Mark seems to have soon dropped out. The family’s strong socialist sympathies were continued by Mark’s son George, my granddad, who himself became a member of the club and went to hear the antiwar socialist John Maclean speak in Honley in 1919. He also owned a copy of the Socialist Sunday School songbook and John S Clarke’s poems, the latter published in 1919 by the Socialist Labour Press in Glasgow. Mark was a cloth finisher and, if letters among my grandfather’s papers belonged to him, was active in the Cloth Finishers Union. His motivation was then clearly political and no doubt reinforced by the number of other local socialists who chose to refuse conscription. However, his brother Hamlet did enlist and served with the Royal Garrison Artillery – on the ‘big guns’ as my father recollected. Knowing that Mark was a CO and had worked in a labour camp in Scotland I put two and two together and made five, assuming he had been in the notorious Dyce Quarry camp near Aberdeen. However, thanks to Cyril Pearce, whose book on COs is reviewed elsewhere on this page, I obtained a copy of his (non) military service records which threw some light on Gt Grandad’s war years. He was not called up until 15 July 1918. By now he was aged 40 and perhaps also because he was a skilled worker his conscription had been delayed until the manpower situation at the front had become critical. Although the big German offensive had been defeated of course no one knew that the end of the war was only four months away. There is no record of him appearing before a tribunal and we don’t know whether he was expecting the call up, or if it came out of the blue. Other socialists he must have known had been taken since mid 1916 so he must have known what to expect, though how far he was mentally prepared to make his stand when it came to the crunch we also can only surmise. ‘Arriving at the depot one soon gets to the stage where one is transferred from being a civilian to being a unit of a great machine’. It was at this point that the real thing began. I was ordered to don uniform. I politely told the officer I did not require the uniform, but of course, the military had to have their way and tied the uniform to me. I was marched across to the barracks where more men were putting on uniform. Perhaps the regime was not so intimidatory by 1918, when the military had dropped their initial policy of trying to break COs by force. Shaw was transferred to Aldershot for court martial while Mark’s was held in the depot on 24 July. He was convicted of refusing to obey a lawful order (signing a form) and sentenced to six months with hard labour. He was then transferred to Margate where it was recorded on 6 August he ‘Refuses to give any particulars or sign the AF M 3666’ and thence to Wormwood Scrub prison. Conditions here were harsh for ordinary prisoners and wardens tended to be even more strict towards COs. Plank beds, basic food, long periods of solitary confinement and sewing mail bags could undermine the morale and health of the strongest man. For Mark the humiliation must have hurt more than the physical hardships, but the confinement , for someone who loved the outdoors (he, later at least, had an allotment, kept bees and went on excursions with the Honley Naturalist Society) must also have been irksome. Nor had he probably been separated from his family for such a long period. 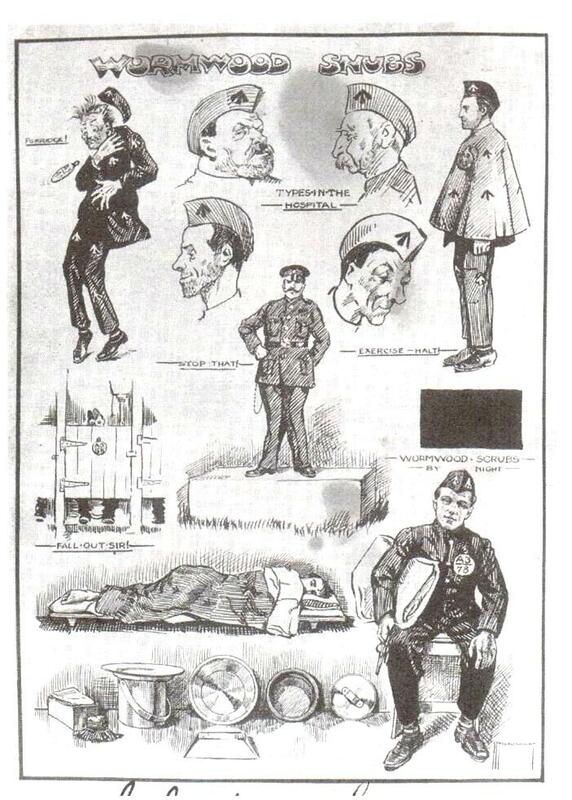 A cartoon post card was published by the No-Conscription Fellowship depicting life in the Scrubs and no doubt black-humour was one way the CO’s kept up their morale. Mark’s stand was not absolutist, that is he did not depart on a course of total non cooperation with the civil or military authorities. He agreed to transfer to the ‘Class W’ Army Reserve on the condition that he would take up work of national importance on a scheme managed by the Brace Committee. This appears to have been on 24 September, but just when he was released from the Scrubs is not clear, nor are his precise whereabouts over the following 18 months. However, by the time of his demobilisation on 31 March 1920 we know that he was at a camp at Uphall in West Lothian. Uphall was the centre of an extensive oil shale extraction and processing industry, a bleak village dominated by spoil heaps and railway lines. The shale was both mined and quarried, which fits in with the family story of Gt Grandad’s sojourn in Scotland. However, we don’t know exactly what he was doing. Only one other named CO is recorded working there, William May a 26 year old Scottish International Bible Student (‘Jehovah’s Witness’) and No-Conscription Fellowship member who had been through Barlinnie prison, the Wakefield Prison Work Centre and Broxburn Work Camp, before arriving at Uphall. In October 1918 he was fatally crushed by a railway wagon while working alongside other COs for a firm called Messrs Rough. The prisoners were allowed leave and it may be on one of these occasions that Mark must have gone to have his photo taken to send to his family, unless it was to celebrate his demobilisation. We don’t know whether he had seen his wife and son George since his conscription. The photo, though printed on a post card, was not mailed. It may have been one of a batch. On the back is stamp in blue ink ‘McClelland Photographers. Uphall Stn. Order No. [written]2108’. This refers to Uphall Station , not merely a railway station but in fact a village near Uphall, and site of a large oil refinery. The name meant nothing to me before Comrade Pearce uncovered his military records. But there still remained the slightly disconcerting depiction of Gt Grandad apparently in military uniform. Thanks to the marvels of the internet the mystery has been solved. 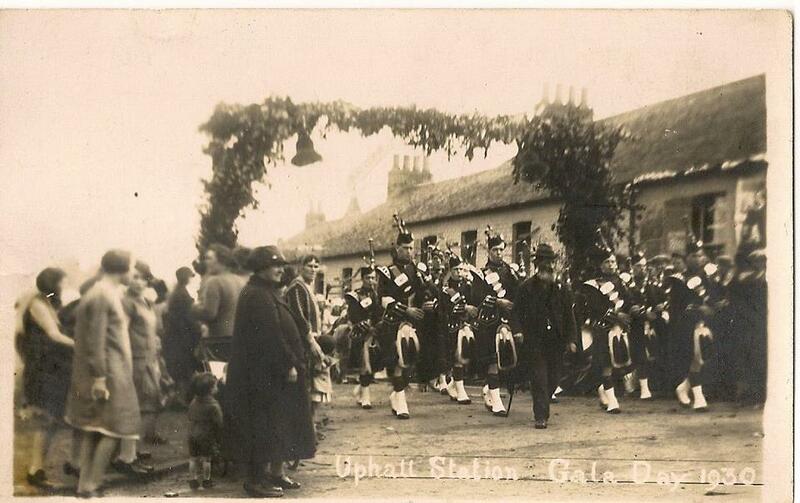 One of Uphall Station’s main social festivals is an annual gala held in June. A photo from 1930 shows the procession headed by a highland pipe band. 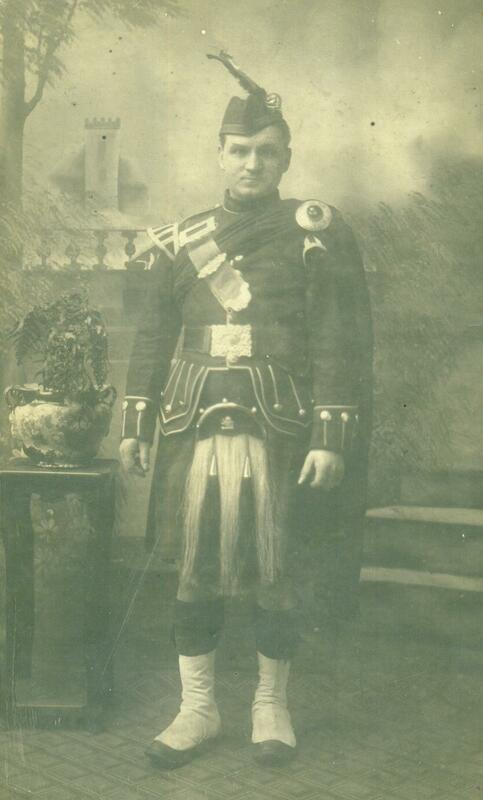 The uniform of the bandsmen, sporran and all, is exactly the same as that worn by Gt Grandad in the photo ! Had he seen them in his stay at Uphall ? Was the uniform just a costume used by the photographer to give tourists a taste of bonny Scotland ? We shall never know. But the photo and a few sentences of family tradition have opened up another strand in our local underground history. The time when Great Grandad Brooke refused to go to war. A Footnote on the Shale Oil Industry. Following the war the shale oil industry entered a terminal decline. 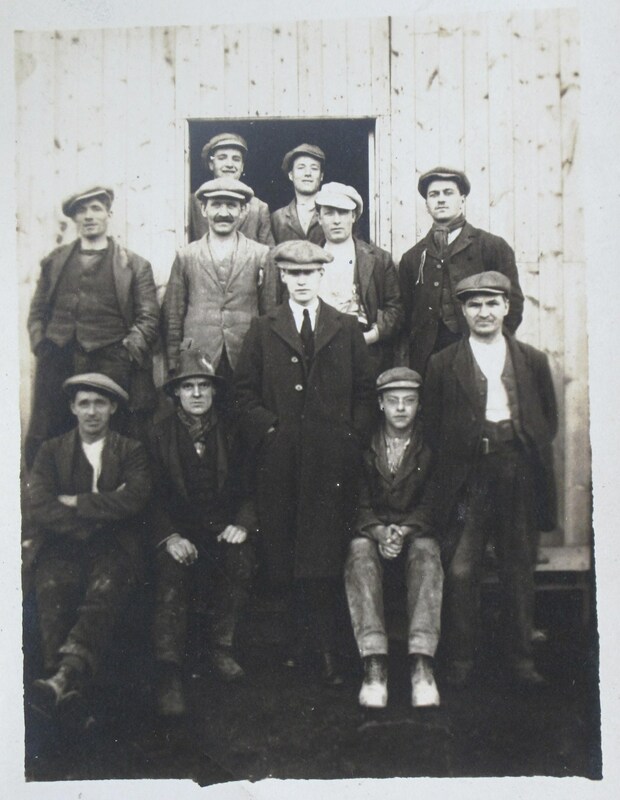 In 1925 the workers in the Shale Miners’ Union at the Uphall refinery went on strike against Scottish Oils Ltd’s attempt to impose wage cuts and redundancies. The company was also involved in Persian oil exploitation which produced a much greater output than the refineries at Uphall and Grangemouth. They claimed to be loosing money on the oils shale side of the business, but were able, however, to pay a 7% dividend from their £210,000 profits. An enquiry was set up to examine whether they were indeed loosing money on oil shale production. The union ballotted its members on a deal which would have seen a third of the 182 workers at the two refineries loosing their jobs. (Daily Herald 8 December 1925) . I hope to discover the outcome of this dispute and post details later. Great Grandad Mark Brooke at Uphall. It is not known whether the other men are also COs.
Alcatraz – Uncle Sam’s Devil’s Island : experiences of a conscientious objector in America during the First World War Anarchist Age Weekly Review #728, 19 February-25 February 2007. Three years after he was first imprisoned and almost 2 years after the war had ended, Grosser was released on the 2ndof December 1920. Mentally scared by his experiences, hit hard by the depression, Grosser ended his life by jumping in front of a train in Boston in early November 1933. My grandfather Clement Edwin Brown was a conscientious objector who was sent to Dartmoor. He later migrated with his wife and baby son to Australia in 1920 because he was convinced that there would be another war. He said that he had gone on hunger strike and had been force fed. he was born in Leicester and was orphaned at an early age. My great Grandfather, Bernard Malcolm Bonner was also a conscientious objector, who we believe was also sent to Dartmoor. We’re finding it very hard to find information on how long he was there and his later life. We visited Dartmoor prison museum recently, but unfortunately a great deal of the records were destroyed in a fire in 1932, so we are at present at a stand still. Not sure where he was born, but would have lived in Bedfordshire at some point, but never heard his name mentioned by family and unfortunately most of those that would have known him are no longer with us. Bernard Bonner has an important place in CO history. Cyril Pearce’s CO Register contains details of Bernard M. Bonner’s experiences as a WW1 CO. The plan is for the ‘Pearce CO Register’ to go live on-line and free as part of the Imperial War Museum’s ‘Lives of the First World war’ digital platform, later in the year. Many thanks for your reply Cyril. First off apologies, as not sure why I typed Great-Grandad, he was in fact my Great-Uncle. My husband has been trying to find out a bit more as we are very interested, and we had seen that he was originally to be shot but then was changed to ten years penal servitude. We heard mention of Princetown, Dartmoor Prison, but not really sure whether he was sent there or somewhere else and whether he completed his ten year sentence. We also found some vague info on him being linked to Jehova’s Witnesses. We would love to know more about his experiences as a WW1 CO., and also what became of him when released from Prison. We think he may have married but while investigating our family tree, we got stuck at that point. We now have plans to visit Kew national archives and also The Imperial war museum and will certainly look on line later in the year. But if you have any other info you could give us, that would be really great. Dear Lin: Bernard M. Bronner was indeed a Bible Student (now Jehovah’s Witnesses) who, as a 21-old CO, was sent to France in 1916, together with the “Richmond 16” COs. They were secretly (!) sent to France by Horatio Herbert Kitchener who wanted to make an example: As long as COs refused military service in Great Britain, they could not be sentenced to death. But this was possible as soon as they refused to fight at the front line – e.g. in France. There your Great-Uncle was sentenced to death in June 1916 (together with 33 other COs, 8 of them being Bible Students), commuted to 10 years hard labor after interference by Herbert Asquith, and sent to Dartmoor Prison (obviously in 1917). Please note that your Great-Uncle’s story was published in a scientific reference work last year in German (which will also be published in English and Russian): Jehovas Zeugen in Europa – Geschichte und Gegenwart [Jehovah’s Witnesses in Europe – Past and Present], vol. 1, Lit-Verlag: Berlin 2013 (eds. : Prof. Gerhard Besier and Prof. Katarzyna Stoklosa), in the article “Und plötzlich waren die Deutschen da”: Die Verfolgung von Jehovas Zeugen in Frankreich und Luxemburg [“And suddenly the Germans were here”: The Persecution of Jehovah’s Witnesses in France and Luxembourg], pp. 92 to 96 (by author Angela Nerlich). I learned that, in vol. 2 of this 3-volume reference work, Bernard M. Bronner’s story will again be mentioned in an article about Great Britain. I hope this information is of some assistance to you. Hello Lin My great grandfather was in Dartmoor as one of Jehovah’s witnesses taking a stand against war. His name was Thomas Russell, and I have a postcard sent to him by your Great Uncle dated 10 Sept. 1917. Hi David. I have only one ‘T. Russell’ on my database and the information about him is very ‘thin’. I picked him up from the Minutes of the Central Tribunal which are at the National Archive at Kew. He went before the Central Tribunal at Wormwood Scrubs on the 4th October 1916, was judged to be a ‘genuine’ CO and allowed to join the Home Office Scheme. This would account for his being at Dartmoor. I know nothing about where he came from, what he did for a living, how old he was or about his Court Martial … in fact it is a very poor entry altogether. If this is you ‘T. Russell’, please can you help fill in the details? BY the way, do you know about Gary Perkins’ JW website Forthesakeofthekingdom? Gary has been gathering data on JW/IBSA COs and has a pretty full record of many of them. I have this article with great interest and it has given me a fresh and much clearer understanding of what there men went through. The William May mentioned in the Uphall article was my great grandmothers brother. I had read his service record and initially assumed he was either a very bad soldier or plain difficult, how wrong I was. I was wondering if you had more information about Uphall? Many thanks for this very enlightening article. Yes Thomas Russell is my great grandfather, he was born and lived in Stockton-on-Tees, as I did, and he was a JW all his life. I didn’t have the info about Wormwood Scrubs, just the record of his time in DCP, and several cards written by him to the family, and by others to him. I also have a group picture of about 40-50, which may be him with CO colleagues in 1916, I don’t where it was taken, looks like in front of a government building. I can send you any of these as I have them scanned. I didn’t know about Gary Perkins site, I will send him my info. My step-grandfather was Willie Shaw. Would be grateful for any information about him. Your best bet would be to get in touch with Cyril Pearce, author of ‘Comrades of Conscience.